Dominique Coulon & associés handed over the keys of the Media Library in Thionville on mai 18th 2016 in the presence of Jackie Helfgott, 3rd Deputy Assistant for Culture, Heritage, Tourism and Transportation. This project will be entirely dedicated to culture and creation. 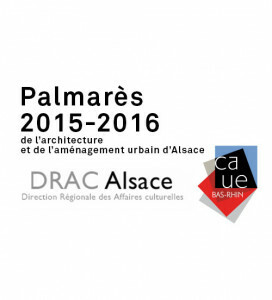 As part of the Palmarès 2015-2016 de l’Architecture et de l’aménagement urbain d’Alsace, organized by the DRAC d’Alsace and the CAUE67, Dominique Coulon & associés has been honored as Lauréat in "educational public buildings" category groupe scolaire Saint-Jean à Strasbourg. 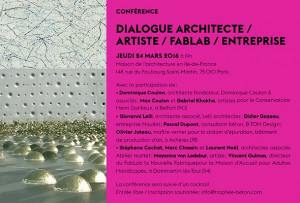 Maison de l’architecture en Ile-de-France, 148 rue du Faubourg Saint-Martin, 75 010 Paris. detail - "Wohnen im Alter"
Le projet d'EHPAD de Pont-sur-Yonne est mis à l'honneur dans le cadre de l'exposition intitulée "Wohnen im Alter" orgnaisée par DETAIL. La présentation met en avant des projets au concept innovant en matière d'habitat pour personnes agées. 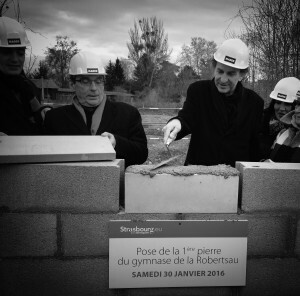 The foundation stone of the future sports hall at the entrance to the Robertsau district, facing the European institutions, was laid on January 30. This new equipment will be equipped with thermal qualities to limit its energy consumption. On a surface of 5000 sqm, the future sporting equipment will include a gymnasium and a multipurpose room. The delivery is scheduled for the school year 2017. In the large room, the ground can be divided into three and accommodate among others: basketball, volleyball, badminton. The floor is designed to accommodate the practice of disabled sports and sports on wheels. In the adjoining room, the ground will be dedicated to dance, gymnastics and martial arts. The local gymnasium will not only be reserved for the 1,200 pupils of the European school, it will also be accessible, outside school time, to the sports training of neighborhood associations. As part of the series of lectures organized by the University of History and Art Tuebingen in collaboration with the Chamber of Architects ; Dominique Coulon will give a lecture Tuesday, December 8th, 2015 at 20h entitled Clarity and Complexity . 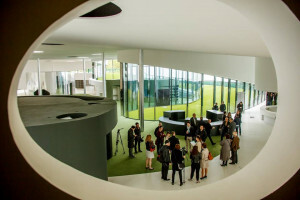 The Tuebingen's University series of lectures have invited wide acclaimed architects from around the world with an audience of 300 people at each conference. Several renowned international architects preceded Dominique Coulon such as Zaha Hadid , Richard Meier, Daniel Libeskind , Peter Zumthor , James Stirling, Ben van Berkel , Wang Shu or Sou Fujimoto. 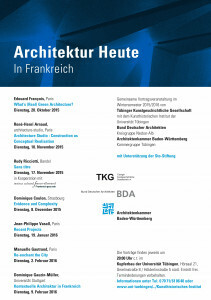 This year today's French architecture is in the spotlight : Architektur Heute in Frankreich.